The theoretical size of a load bearing beam required to support a particular weight is easy to calculate, but the choice of the actual beam depends on taking into account the factors of the particular situation. 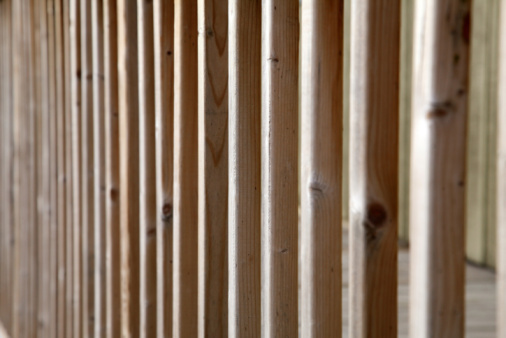 To address possible imperfections and weak spots in the wooden beams, it is common to install the required cross section by placing several smaller beams side by side. Beams on 16-inch centers will also reinforce each other. The theoretical calculation also usually assumes an even distribution of weight and that the ends of the beams are not only supported but held rigid. Make sure that this applies in the particular case or use oversized beams. Standard 2-by-12 beams on 16-inch centers are used to span 15 feet. Calculate the weight the beam must support. For a flat roof with snow loading, this is 25 lbs. per square foot for northern areas of the U.S. For rooms which are heavily frequented, it may be 50 lbs. per square foot. 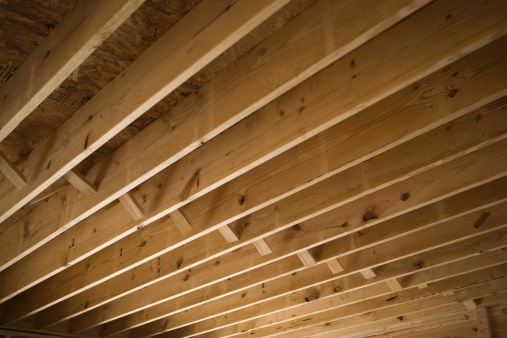 Multiply the loading per square foot by the area in square feet of the surface which the beams will be supporting. Divide by the number of beams which will be installed to get the loading per beam. Calculate the maximum bending moment for the wooden beams. The bending moment is the length of the span times the weight to be supported divided by 8. For a beam spanning a 12-foot room and supporting a weight of 600 lbs., the maximum bending moment would be 12 x 600/8 = 900 foot-pounds. Calculate the beam's section modulus by dividing the maximum bending moment by the allowable fiber stress for wooden beams. The latter is 1,150 pounds per square inch. Multiply the maximum bending moment of 900 foot pounds by 12 to get 10,800 inch-pounds. Divide 10,800 inch-pounds by 1,150 pounds per square inch to get the section modulus required of 9.4 cubic inches. Calculate the section modulus for the different beams which you could use. The formula for the section modulus is beam width times beam depth squared divided by 6. A two 2-by-6 standard beam has actual dimensions of 1.5-by-5.5 inches which would give a section modulus of 1.5 x 5.5 x 5.5 / 6 = 7.6 which is not enough for this example. A 2-by-8 beam would be sufficient. Two 2-by-4 beams together would not be enough.